The Mu Koan (or Wu Gongan in Chinese pronunciation), in which master Joshu says “Mu” (literally “No,” but implying Nothingness) to an anonymous monk’s question of whether a dog has the Buddha-nature, is surely the single most famous expression in Zen Buddhist literature and practice. By virtue of its simplicity and indirection, this expression becomes emblematic of East Asian spirituality and culture more generally. Entire books have been published on the topic on both sides of the Pacific. However, in conducting research for a new monograph titled Like Cats and Dogs: Contesting the Mu Kōan in Zen Buddhism, I have been surprised to find how little seems to be known about the origins and implications of the koan case record. My studies suggest that this is one more example of commonly-held myths based on long-held beliefs and customs often overtaking and suppressing investigative scholarship. Although almost all commentators attribute the word Mu to Joshu, who was said to have lived for 120 years and died near the end of the ninth century, the case is not mentioned in the earliest records of his teachings composed in the tenth and eleventh centuries. Joshu was better known at the time for many other famous koans, including a case in which his master Nansen cuts a cat in two and Joshu, in response to this violent act, puts his sandals on his head. Early Zen records do include a dialogue about the dog’s Buddha-nature involving another monk who lived a generation prior to Joshu, which concludes in a much more open-ended and ironic fashion, as well as a dialogue about the Buddha-nature in relation to an earthworm being cut in two featuring yet another disciple of Nansen. While commentators generally refer to Joshu’s unapologetic denial in response to the monk’s probing query about the doctrine of the universality of ultimate reality, reading over the voluminous Zen texts from China and Japan reveals that the koan tradition holds at least a dozen versions of the case. These include: (1) the Mu response accompanied by a dialogue probing why not (there are at least two variations of this dialogue); (2) two versions of the case where the answer is positive, one of these with “Yes” (Jpn. U, Chn. You), and including a brief dialogue searching for the reason; and (3) several versions combining the positive and negative responses with or without the follow-up dialogues, and with the No answer appearing either prior or subsequent to the Yes answer. The main interpretations suggest that the term Mu puts an abrupt end to any discourse or analysis of the meaning of the question and response. However, the classical records reveal that there are dozens or even hundreds of verse and prose commentaries in Chinese and Japanese texts. Many of these do support the head-word method, while countless others, which prefer one of the other versions of the case, tend to bypass, disagree with, or even contradict that outlook. In one example, a Zen master says simply, “Daie affirms No, but I affirm Yes.” It becomes clear that the head-word device is rooted in a particular era of Chinese religious and cultural history. Daie’s comments on the koan probably originally targeted an audience of lay disciples whom he accumulated during his abbacy stints in both the remote countryside, while he was exiled for political reasons for over fifteen years of his career, and the capital, when he regained the favor of the authorities during the final period of his life. However, other important texts from the era, such as the Record of Serenity (Chn. Congrong lu, Jpn. Shoyoroku) in addition to the “Bussho” or “Buddha-nature” fascicle of Dogen’s Shobogenzo, both of which are available in several English translations, reveal multiple possibilities for interpreting one or more versions of the case, especially the rendition that has both positive and negative responses as well as additional dialogues about each of these alternatives. In light of the tremendous degree of variation and variability in koan commentaries, we must ask what has led to many interpreters insisting that the true message of the case is absolute nothingness, which might result in a reification of nihilism, while others argue that the point of the case is the relativity of affirmation and negation, which might result in a antinomianism. It seems clear that the full implications are not revealed by translations/interpretations focusing exclusively on the emphatic “No” response, which is sometimes given with an exclamation point or a transliteration of the Sino-Japanese original for stress (as in “Mu!” or “無!”). Instead of remaining bound to one view or the other, the conceptual entanglements indicated by contradictory or paradoxical versions of the koan can be continually explored without seeking a firm conclusion. The reason for apparent misconceptions is the extent to which one specific view of the case has been portrayed in numerous writings as the only valid approach by leading contemporary scholar-practitioners who represent three different schools — Korean Zen, the Rinzai (Chn. Linji) school of China and Taiwan, and the Japanese Soto sect. The standpoint they endorse focuses exclusively on appropriating the best-known version of the case from the Gateless Gate (Chn. Wumenguan, Jpn. Mumonkan) kōan collection of 1229. The common approach espoused by three different advocates emphasizes a particular understanding of the role of the koan based on the “head-word” or “critical phrase” method developed by the prominent twelfth century Chinese master, Daie. This approach takes the “Mu” response in a non-literal way to express a transcendental negation that becomes the topic of an intensive contemplative experience, during which any and all thoughts or uses of reason and words are to be cut off and discarded for good rather than investigated for their expressive nuances and ramifications. Yet, historical studies demonstrate quite persuasively that an overemphasis on this single approach to one version of the kōan is somewhat misleading. Steven Heine is an authority on Japanese religion and society, especially the history of Zen Buddhism and the life and works of Dogen. 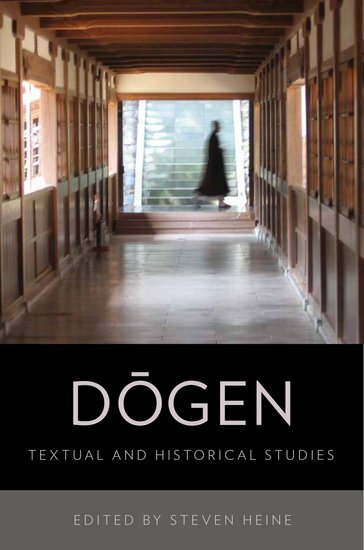 He is the editor of Dogen: Textual and Historical Studies. He has published two dozen books, including Did Dogen Go to China? (2006); Zen Skin, Zen Marrow (2010); and Zen Masters (2010). I appreciate the research and scholarship of Mr. Heine, but I don’t think it refutes the current uses of Mu as the first koan in the Gateless Gate. Each koan is just one entry point into the vastness of human experience. And the lovely thing about so many of these koan cases is that even the ‘answer’ is not the answer. Having read several books on Zen in my youth, I recall an interpretation which I have not seen here or elsewhere. I can’t believe I made it up, so perhaps a Zen scholar will enlighten me as to the source. This interpretation is that by shouting “Mu!”, Joshu was imitating the sound of a barking dog, an affirmation and at the same time a negation. This would be a spontaneous and startling response to the monk that might awaken the prepared mind from the confines of logical thinking, ego and identity. For me, this interpretation implies that the story (this koan) is irrelevant to the enlightenment of the monk. Had he read the koan, had he contemplated ‘Mu’ over decades, would he have been enlightened? Mu! Gutei spent years meditating and chanting the Kannongyō (the twenty-fifth chapter of the Lotus Sutra), and yet when challenged, could not speak a word of Zen. It took Tenryū’s spontaneous and startling one-finger to awaken him (and still, it seems the best he could do as a Zen teacher was to imitate Tenryū until he cut the finger off his boy attendant. That was a spontaneous and startling act which enlightened the boy. Gutei has been properly criticized for this, but not, I think, for the violence of the act, rather for having imitated Tenryū’s one-finger for so long, as if the act of raising a finger communicated Zen. Perhaps his experience with Tenryū was so profound he actually believed that it did. His critics (Mumonkan) seem to suggest that imitation made his teaching stale and powerless. It took such an audacious act for Gutei to be spontaneous and startling, a reawakening for Gutei in awakening the boy. David smith! Best answer! Mr. lack’s of undestanding! Does a dog have a budda nature. Answer: it depends on the dog. Does the dog have Buddha nature? There’s a deer in the yard. The dog has Buddha nature! Does the Buddha nature contain a dog?